One of life’s safest bets is that following a visit by a Japanese premier to the Yasukuni Shrine, which honors the nation’s war dead, a lot of Chinese mega-crooks and inheritors of the greatest murderer of all time will cry foul, and lots of buffoons of the neocon and liberal persuasion over here will echo them. A particularly mendacious fraud, one Daniel Sneider, who is described as an “associate director of research at the Shorenstein Asia Pacific Research Center at Stanford University,” enlightened us by saying that Premier Shinzo Abe’s recent visit to the shrine is proof that he is still trying to push his patriotic remake of postwar Japan. Oh, dear! If Sneider says so, Japan could be planning another Pearl Harbor and is about to unleash their Zeros on us. The misleading and tendentious New York Times plays the visits up and never fails to mention Japanese war crimes in China and Manchuria. The biggest war crimes of all”the dropping of two atom bombs on Hiroshima and Nagasaki”are never mentioned, nor is Curtis LeMay’s firebombing of Tokyo that incinerated mostly old men, women, and children in the thousands. They started it and we finished it, say sofa samurai over in these shores, but I am convinced about who started the war, and it wasn’t Mr. Tojo or Mojo, or Hirohito, for that matter. 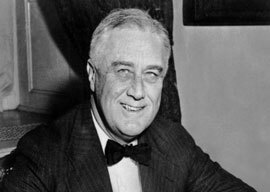 It was FDR, a liar and war criminal par excellence, whom the great American public elected president four times. But before I go on, I must declare an interest. I love Japan and its martial tradition, love the concept of Bushido, and have rarely met a Japanese person I’ve disliked. Let’s face the facts: Roosevelt and his gang were anxious for war with Japan, and it all had to do with the root of all envy. During the 1930s Japan rapidly expanded her industrial production, while the rest of the world (except Germany) stagnated. By 1941 Japan had become East Asia’s leading economic power, and her exports were steadily replacing those of America and Europe. Japan had very few natural resources. What she had was an honest money system, based on the government creating the nation’s money and credit on an interest-free basis, eliminating bankers” usury and the phony overseeing of the banking system as practiced by the Federal Reserve in America. Once the shackles of usury had been removed around 1931, the Japanese economy skyrocketed, as did industrial production. But in July 1939 the United States unilaterally abrogated the Treaty of Commerce of 1911, thereby restricting Japan’s ability to import essential raw materials. An aviation fuel embargo and a ban on the export of iron and steel followed in 1940. In July of 1941 all Japanese assets were frozen after Japan had peacefully occupied Indochina with the permission of Vichy France. By means of an economic blockade, a noose was being placed around Japan’s neck. The US, Britain, Holland, and China had encircled Japan through economic pressure, but also naval forces in the region of the Philippines, Singapore, and Malaya were redeployed and strengthened. Yet despite all the provocations, Japan attempted to negotiate with the great powers and made concession after concession in the hope of finding a peaceful solution. The Japanese are not stupid. They knew that Uncle Sam had the ability to produce warplanes and material that little Japan had no hope of ever approaching. Japan finally decided to go to war on December 1, 1941, and we all know the rest.